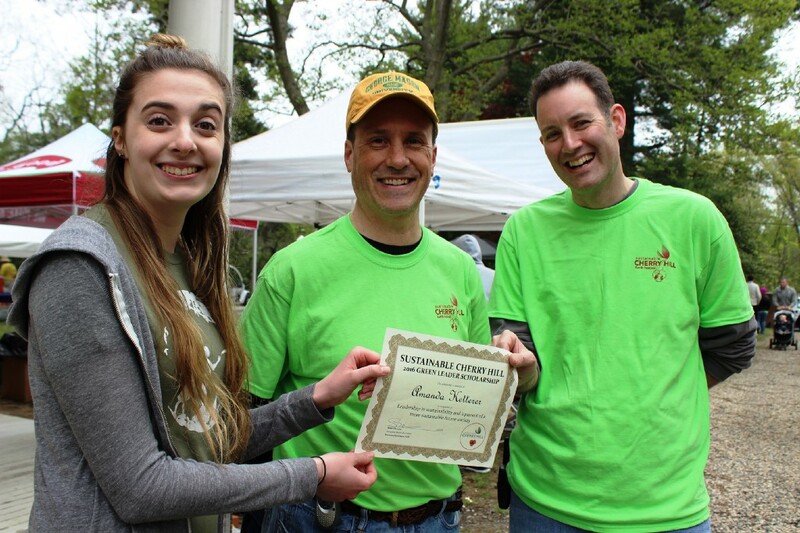 Amanda Ketterer receives her Sustainable Cherry Hill 2016 Green Leader Scholarship from Sustainable Cherry Hill president Scott Downie and Sustainable Cherry Hill secretary Chris Eattock at the organization’s Earth Festival on April 30. Sustainability has been a part of Amanda Ketterer’s life for the past decade. The Cherry Hill High School East senior’s first foray into sustainability came about 10 years ago, after reading a book from anthropologist Jane Goodall entitled “The Chimpanzees I Love: Saving Their World and Ours.” The book inspired Ketterer to start the Chimp Aid Café, a small lemonade stand where proceeds would be donated to the Jane Goodall Institute, a nonprofit organization promoting conservation efforts in many areas of the world. The name Chimp Aid Café came from the institute’s efforts in protecting chimpanzees in Africa. Since then, Ketterer has donated hours of time and energy to helping the earth. As a result, Sustainable Cherry Hill recently recognized Ketterer for her efforts. Ketterer was the 2016 recipient of the Sustainable Cherry Hill Green Leader Scholarship. The $500 scholarship is granted annually to a graduating high school senior from Burlington, Camden or Gloucester counties who is seeking to pursue post-secondary education in sustainability, a field supporting sustainable living or those seeking to be change agents in the world around them. This is the second year the Green Leader Scholarship was awarded. “We really wanted to reward young students who want to be leaders in some kind of sustainable field,” said Chris Eattock, a Sustainable Cherry Hill executive board member who helped start the scholarship program. The award is very fitting for Ketterer, who has volunteered for and partnered with Sustainable Cherry Hill for a number of years. When she was younger, Ketterer would set up the Chimp Aid Café in places such as Cherry Hill swim meets and township festivals. Despite her busy schedule, she still sets up the Chimp Aid Café each year at the Sustainable Cherry Hill Earth Festival. “Sustainable Cherry Hill has been the reason the Chip Aid Café has kept going for all of these years,” Ketterer said. Ketterer has also volunteered with Sustainable Cherry Hill. During her junior year at Cherry Hill East, Ketterer and some of her classmates in an environmental studies course volunteered for the organization. Eattock said Ketterer’s resume stood out over the other applications for the scholarship. A small committee of people selects the winners each year. Names are removed from the applications so the winner is selected based on their accomplishments. Ketterer speaks enthusiastically about the earth and sustainability. She’s on a mission not only to protect the planet and promote sustainability, but also to get others involved. Ketterer is determined to make sustainability a part of her future career. Next year, she will attend George Mason University and major in environmental sustainability. The move to college won’t change the Chimp Aid Café either. Ketterer plans to bring the café to George Mason and continue to run it when she has spare time. That doesn’t mean the café won’t be seen in Cherry Hill anymore either. Ketterer still hopes to bring it to future Sustainable Cherry Hill events.